In a desperate bid to halt the oil pipeline vandalization by the Niger Delta militants, the Nigerian Army has responded with force by sending military personnel to the area. Nigeria deployed 3400 troops and 4 warships to the Niger Delta to stop Niger Delta militants vandalizing oil pipelines in the hopes of easing the hard-hitting recession the country has faced in the last one year. Rear Adm. James Oluwole, flag officer commanding Eastern Naval Command, announced the deployment, with the code name “Exercise Sharkbite” on November 3 in Onne, Rivers state. The warships deployed by Nigeria for the operation were the Nigerian Navy Ship (NNS) Okpabana, NNS Ologbo, NNS Burutu, NNS Sagbama, and a naval Augusta helicopter, while the 3,400 personnel included 3,000 ratings and 400 officers. 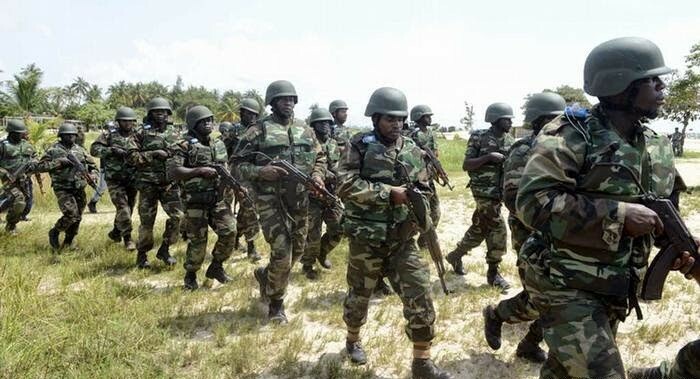 According to Oluwole, the exercise is also aimed to determine combat readiness of the soldiers to tackle militant attacks on oil and gas pipelines, which caused the recession in Nigeria. A vast military exercise. The officer revealed that the exercise covers 24,000 maritime miles between Rivers and Cross River states coastal areas, and that it would promote socioeconomic activities at the nation’s maritime sphere. “This exercise was informed by worsening vandalism of critical oil and gas infrastructure by militants, which has plunged the nation into recession,” Oluwole said. “The Nigerian Navy must be in the best position to secure critical oil and gas infrastructure both ashore and offshore for socioeconomic activities to thrive in our maritime domain. It will be recalled that President Muhammadu Buhari has recently held two meetings with with leaders of the Niger Delta to resolve the crises that has bedeviled the region for years and affected Nigeria’s oil output an revenue. All measures to stop the country from it spiraling economic crisis is being put in place. With oil pipeline vandalization topping the list of priorities, alongside corruption and mismanagement of funds.